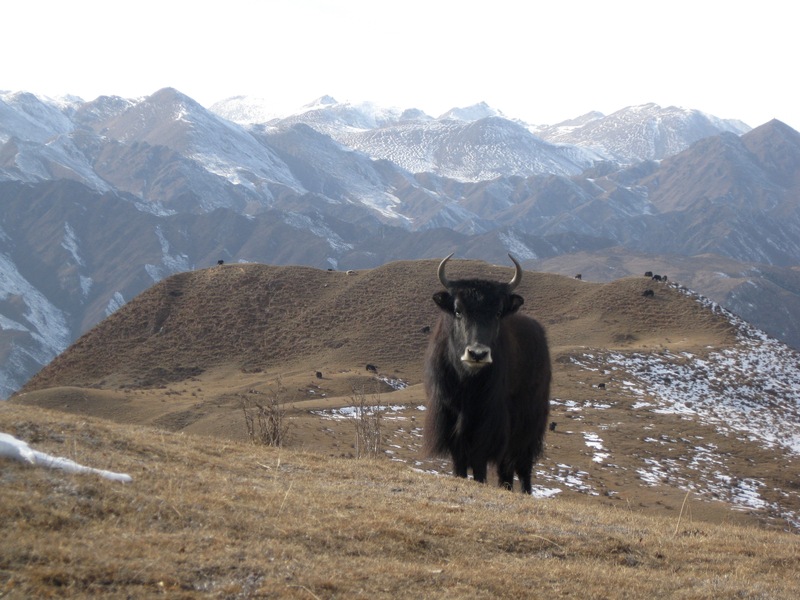 Also informally known as “Yogurt Town”, the village of Garze 瓜什子 འགར་རྩེ is seemingly entirely made up of shops selling delicious yak yogurt from the surrounding grasslands. It’s worth coming up here for the drive alone. Not to give away too much, but you’ll experience an astonishing array of landscapes and ecosystems in the short 1 to 1.5 hour drive from Rebgong. On the ascent to Garze is the town of Shuangpengxi 双朋西, nestled amidst some astonishing redrock scenery. Nearby are several temples, a massive golden mountaintop statue and the home of famous Tibetan writer Genden Choephel – as well as a beautiful school built (with French funds) in his honor. By the time you get to Garze, you’ll have broken out of a narrow forested canyon into wide-open grasslands – which are beautiful and an excellent place to go hiking/camping. If your navigational skills are up to par, you can do a backpacking trip between Rebgong and Garze in one/two nights. In town is the beautiful Garze monastery, which is well worth a visit. If you head south along a beautiful road looping through the grasslands and up over a pass, you’ll eventually end up in remote Dowa. 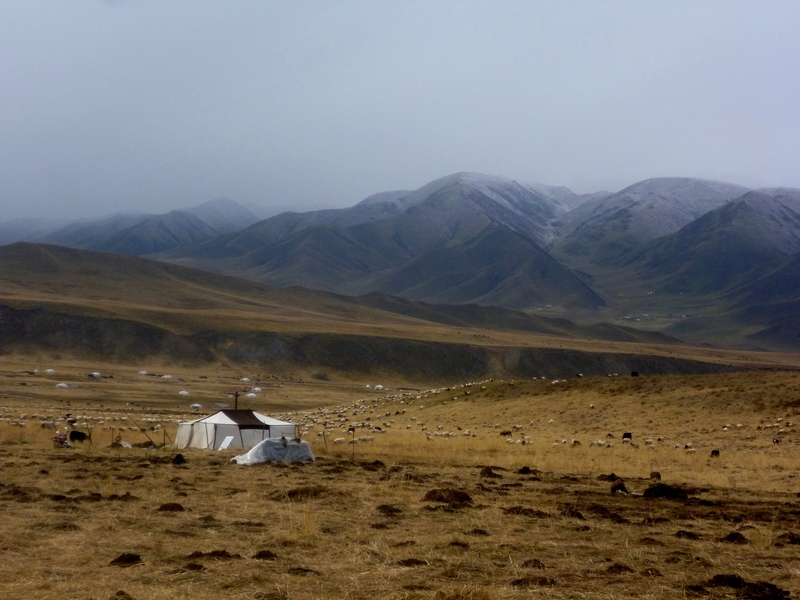 There’s not much of anything in this vast, remote region, but its a great place to experience traditional nomadic culture. If you go here, make sure you’re well-prepared and have everything you may need. It’s possible to hike from this region to Rebgong or Tsekok/Zeku (via the Gu-Chu canyon and – if you’re lucky – Dorjedzong Gonpa (see below) – in 2-3 days. If you continue east from Garze towards Xiahe/Labrang, you will cross a pass into Gansu province and find yourself in the vast Ganjia 甘加 grasslands, another great place to explore. In the area you’ll find such attractions as Bajiaocheng 八角城, which as its name suggests is an ancient eight-cornered village, and several monasteries. One of these monasteries is near a sacred cave system which, aside from its spiritual significance, has achieved a certain notoriety for being extremely dangerous. Travelers have died here; be careful. To get to this region, jump on the 8:00 bus from Rebgong to Xiahe 夏河 (in Gansu province) or take any van going to Garze or Shuangpengxi. You can also take a minivan to the intersection below Bao’an 保安 (you’ll recognize it by the semi-abandoned factory) and hope to make the Xining-Xiahe bus, which passes through around 10:15-10:45 or so. If you are visiting Rebgong and don’t travel south for 15 minutes to an hour to explore this area, shame on you. The easily-reached Maixiu National Forest Park, better known as the “Maixiu Linchang” (forestry area) is a vast and spectacularly beautiful region just upvalley from Rebgong itself. Jump into a van or bus headed towards Chuku ཆུ་ཁོག། (Chukuhu 曲库乎乡) or Dzenmo བཙན་མོ། (Zamao 扎毛乡) townships (or towards Zeku and Henan) and hop out anywhere that looks beautiful. There are many motorcycle trails leading up into these mountains, which can be followed for an hour or for days on end. Note that the official “Maixiu Linchang” (as marked on maps) is simply the location of the park headquarters; while that region is beautiful, other valleys closer to Rebgong are also quite spectacular. The “Park” is really just the vast area between the southern end of the Rebgong valley and the high pass on the road to Zeku. And while the main valley is comparatively densely populated, a ten-minute hike out of the valley will put you in another world. Beautiful forests of spruce, pine and birch stretch upwards to snowy peaks. 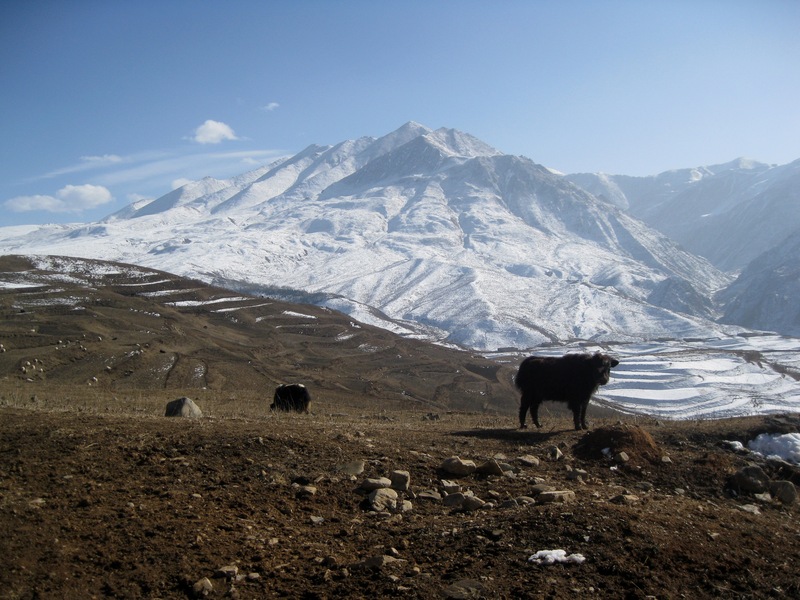 Vast flowery alpine meadows are dotted with yaks and nomad tents. Rushing streams descend swiftly through deep canyons. Monasteries, their red-and-white walls instantly visible amid the otherwise green, white and earth-colored landscape, command impressive views from atop hills. 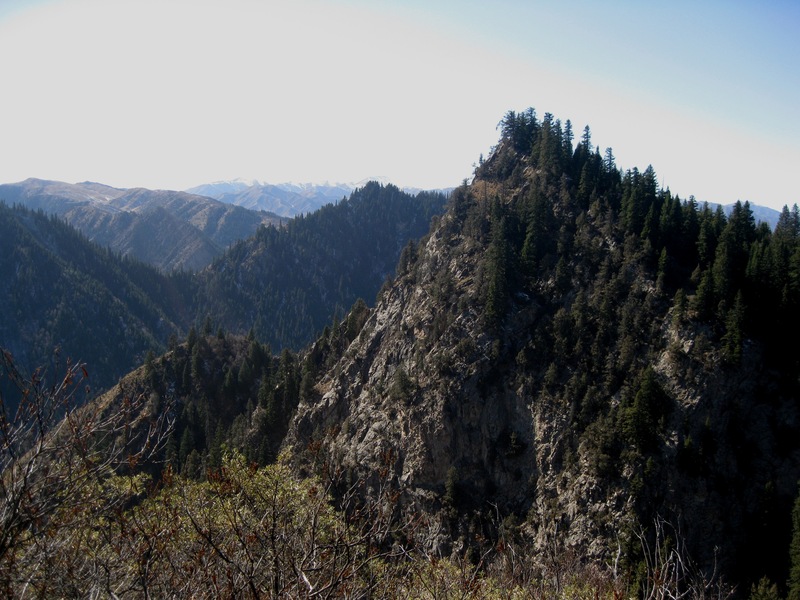 While this area is nominally labeled a park, in its existing state it is more of a hands-off National Forest. As such, while there are tent hotels available in two or three spots (one in the upper valley near the highway, another at the Chuku hot springs), there are really no visitor facilities in or tourist information about this area. While I haven’t had time to explore the whole region, I’ve been a number of places and, here, will list some of my favorites. One note – while people live in this region, it is nevertheless remote and largely roadless. As such, take all wilderness precautions. Take extra wilderness precautions, actually – there are really no detailed maps of the area (the best ones seem to be from county-by-county atlases of Qinghai) and even on a day hike it’s easy to get lost or find yourself in a nasty spot of trouble. The terrain is much more complex than it initially appears, with gentle slopes and wide valleys dropping into narrow cliffs and impassable (unless you fancy a swim) gorges. Do out-and-back trips (e.g. no loops) so you know exactly what you’re getting into – unless you have really good backcountry navigation skills and several escape plans (as well as a riverful of water). 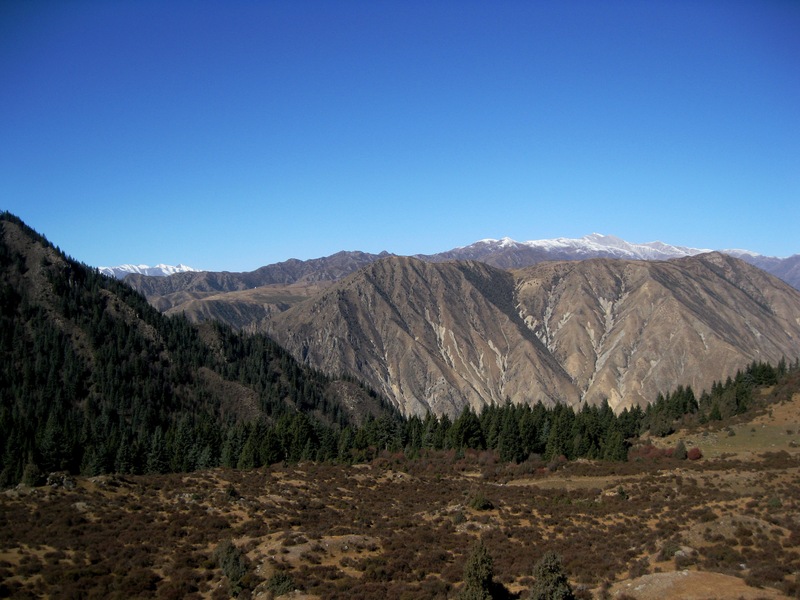 Janglung ལྕང་ལུཅ། (Jianglong 江龙)This valley is only five or ten minutes from Rebgong by car. And once you pass through the village and by its two monasteries, you will find yourself on one of two or three motorcycle tracks that lead upvalley through stunning forest-meadow scenery. Two of the tracks ascend from the valley floor to high meadows dotted with nomad encampments; one of these trails goes all the way up the valley and over a high pass to the grasslands near the distant township of Dowa (from which, in turn, you can get to Xiahe in neighboring Gansu province!). Other trails also link up with the Shibsha area (explained below). Get yourself a map (which, by the way, won’t be too detailed) and start exploring. Around Chuku township ཆུ་ཁོག། 曲库乎Chuku-bound vans will drop you either at Dowa (多哇), the township seat, or at Garze a few kilometers upstream. 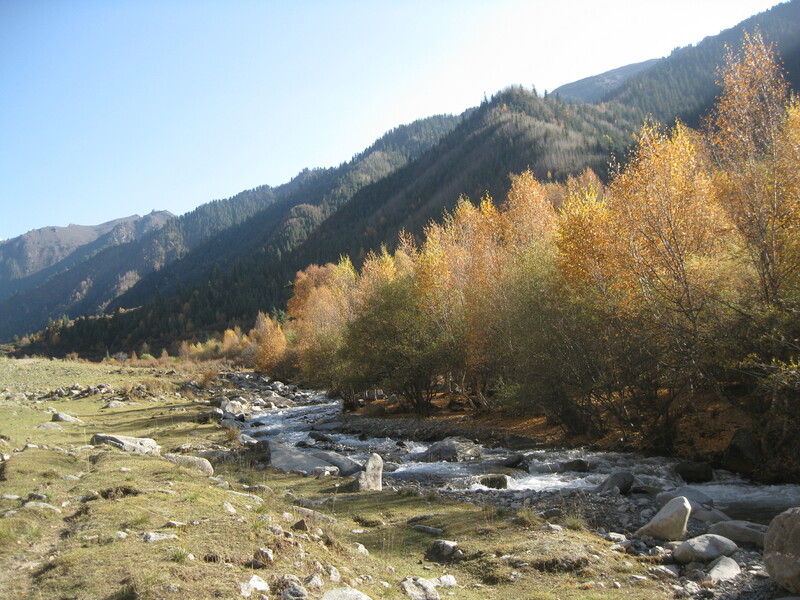 From Garze there are a number of options – pick a side valley and go. One valley leads to the questionable Qukuhu hot springs (see below). Shisa area དབྱི་ས། 西卜沙 Just upvalley from Chuku township is the village of Shisa, from which you can hike up (follow the trail to the prayer-flagged pass on the low ridge above town) into a beautiful forest. Continue upwards into alpine meadows. You can bushwhack to the peaks above for wide-ranging views across a fair chunk of Rebgong and Zeku. Also near Shisa (one side-valley towards Rebgong) are the Qukuhu Hot Springs 曲库乎温泉. Above Dzenmo བཙན་མོ། (Zamao 扎毛)The remote region upstream from the small town of Dzenmo/Zamao is one of the most spectacular areas I have yet seen. The crystalline river, encased within a narrow forested gorge, twists sinuously between vertical canyon walls; above, broad grassy plateaus rise to high snowy peaks. And that’s just one little area. The problem? transport is nearly nonexistent. Your best bet is to hire a car or to hitch on a motorcycle. For particularly spectacular views, head about 10-15km from Zamao to where the main river forks in two, and head up either valley. The left valley quickly turns into a gorge between skyscraping peaks and eventually goes to the grasslands near Dobden (! ); the right valley will put you in some of the aforementioned plateau-grassland-mountain areas with spectacular and wide-ranging views of the area (turn right up the obvious dirt road about 5-10km past the forks for some of the best picnic spots imaginable). This area is truly remote and stunningly vast, so come prepared. Closer to Zamao, if you ascend one of the valleys south (left) of town you will eventually find yourself on a grassy plateau with beautiful views; keep heading south and eventually you will hit the main road about 15km west of the Maixiu Linchang. Maixiu Linchang 麦秀林场 (Dzongmar monastery རྫོང་མར་དགོན་པ། and above) Dzongmar Monastery and the Maixiu NFP headquarters are found at the point where the main road to Zeku leaves the main Gu-chu valley and begins to steeply to a pass.But where the main road veers off, the adventure begins (hoorah for tourism cliches!). Follow the paved road upvalley for about 3 kilometers until a three-way intersection in a small village just below where the road begins to climb uphill in earnest. The main road continues steeply uphill to a high pass and down towards Dobden in the Zeku grasslands. But to discover the upper Gu-chu valley, turn left (downhill) on a narrow lane whose pavement quickly gives way to gravel. You’ll soon pass below a tall rock outcrop strewn with prayer flags and into a beautifully forested river gorge surrounded by towering peaks. This road continues for some 20 or 30 kilometers upstream through truly spectacular scenery and past a couple of isolated monasteries. Enjoy!